. . . .Here we see one of the colossal statues of Nefertari standing along side one of Ramesses the Great. Small in comparison to the statues on Ramesses Great temple they are still over 30 feet high. 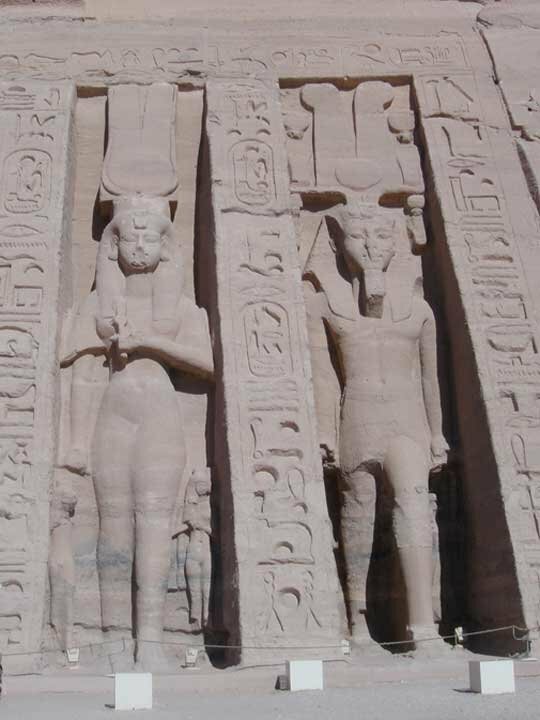 This temple is dedicated to Hathor and so we see Nefertari bearing many symbols of the goddess. Around the royal couples feet are their children. We know that Nefertari bore at least six children because we see them carved into the facade of this temple. Her name Nefertari means the Beautiful Companion.